The Dell Precision T7610 is a capable mid-range workstation, born out of the years of experience from the Austin-based vendor. It is well thought out, expertly designed, sturdy, powerful and reasonably priced for what it offers. Workstations have evolved in three different directions. 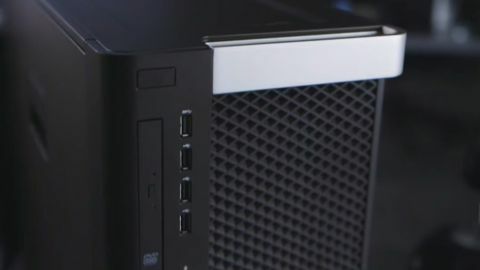 They're adopting a minimalist approach a la Apple Mac Pro, or going the route of an all-in-one like the HP Z1 G2, or more prosaically sticking to the big box approach like this Dell Precision T7610. When we said big box, we mean it. The T7610 is a massive towering case at 438 (h) x 216 (w) x 545mm (d) (16.95 x 8.50 x 20.67 inch) and weighs about 14Kg (31lb). It has two integrated aluminium handles, one at the front and one at the back, which makes moving that bulk around surprisingly easy, and it's ergonomically sensible. As expected, opening it is a doddle and the components are neatly arranged in the spacious case. Dell sent us the latest iteration of the T7610, one that is powered by a single Intel Xeon processor, the E5-2620 v2, a six-core monster clocked at 2.1GHz (with a 2.6GHz Turbo), 15MB cache and a TDP of 80W. Our test machine came with Windows 7 Professional, a downgrade from Windows 8.1 that comes by default but a good option for those unwilling to make the jump to a whole new UI. The charcoal-coloured tower houses a full-size Extended ATX motherboard with an Intel C602 chipset. The latter is populated with 16GB of RAM (four 4GB modules) ECC DDR3 RDIMM clocked at 1.866GHz, an integrated LSI 2308 SAS/SATA controller and a 3GB Nvidia Quadro K4000 full-size card with two DP and one DVI-I port. There's one free processor socket as well as 12 other free memory slots (allowing up to 256GB when filled with 16GB memory modules) plus a 1TB hard disk drive from Western Digital, a Caviar Blue model with 64MB cache, along with a slimline optical drive plus a removable 1300W PSU. It is essentially a clever piece of code that utilises a 128GB Intel SSD to accelerate data transfer, acting as a supersized buffer between the system and the spinning hard drive, all for £148.95. We didn't get to test that option but Dell says that it will significantly improve the system's performance.